Recently I ordered beer from the International Beer Shop in Perth. I was only after a couple of things from them, but seeing as postage is the same for a full carton as for only a couple of beers I needed a full case fillers. 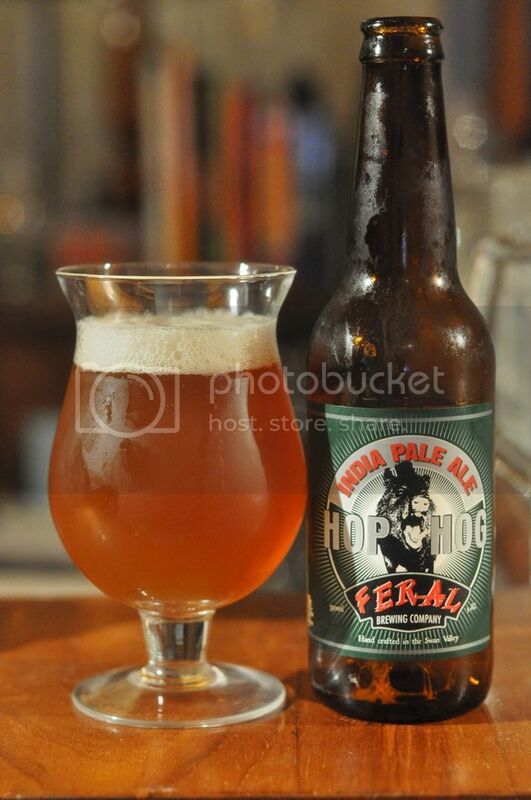 Feral's Hop Hog has long been one of my favourite Australian beers. The guy from Perth suggested getting some Hop Hog as their stock is the freshest in the country. Why not I thought? The fresher an IPA is usually the better, hopefully it holds true to this little gem from W.A. All you can smell on the nose are citrus and other fruit aromas. Lemons, oranges and mango are all prominent as is a light caramel maltiness. As the beer warms you get a huge hit of grapefruit as well, which is so pungent it seems odd that you couldn't smell it from the beginning. The overall aroma leaves me with a very summery feel and is making me crave a hot day to drink this beer on. Today was unfortunately not that hot day, but still what a spectacular beer. There's plenty of bitterness coming from the hops which have all the fruity flavours that I mentioned in the aroma. There's some pine as well but nothing on the scale of some of the big American West Coast IPA's. The malting is actually very reasonable, there's enough to balance the beer but it doesn't impede the progress of the hops as they lay siege to your palate. It's just fantastic! Last year's Critics Choice winner Stone & Wood Pacific Ale was one of my first reviews and is still one of my favourite beers, Hop Hog is just as good! As far as I'm concerned it's Australia's best IPA and I've had alot of them! It's got all the bitterness of an American brewed IPA but with a slightly Australian twist to it. A truly deserved winner!